After two weeks on the picket lines, the union representing striking workers announced Saturday on Twitter that a contract agreement had been reached with two more hotels. GREAT NEWS! We have ratified a contract with the Hotel Allegro and the Hotel Palomar! WE ARE STILL ON STRIKE AT 17 HOTELS! The announcement came just two days after the union had reached an agreement with seven of more than two dozen hotels. The president of the union representing the hospitality workers said in a statement the agreement came at the end of successful negotiations with Marriott. “On behalf of striking members of UNITE HERE Local 1, we wish to thank the members of the Chicago Building Trades, the Teamsters, the Elevator Constructors, and the Chicago Federation of Labor for honoring our picket lines,” said UNITE Here Local 1 President Karen Kent in a statement Thursday. 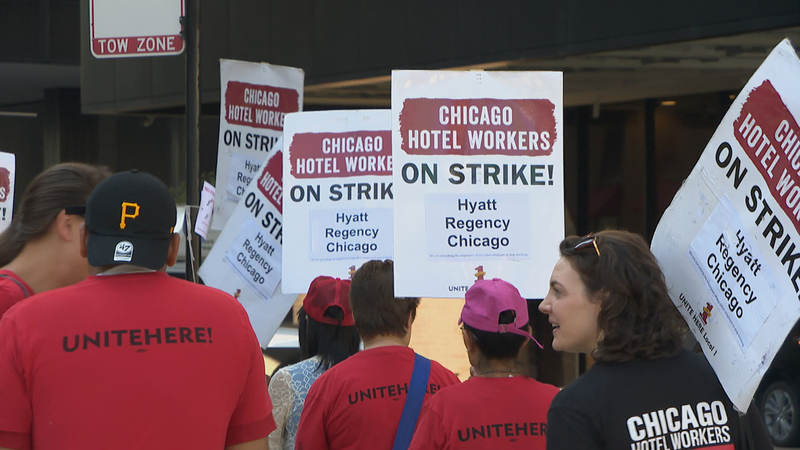 Workers had been striking around the clock at more than two dozen Chicago hotels following the expiration of their contract. UNITE Here Local 1 said they will continue to strike at 17 other hotels. The 6,000 workers – which include housekeepers, bellmen, doormen, servers, bartenders and banquet servers – are seeking year-round health care coverage as many lose benefits when they’re laid off during slower months. Marriott International confirmed in a statement that an agreement has been signed. “We appreciate the assistance provided by the Mayor’s office. We look forward to having our associates back to work,” the statement reads. Contracts expired Aug. 31 and cover 30 hotels, including the Hyatt Regency Chicago, Hilton Chicago, Palmer House and Ritz-Carlton Chicago. Workers began striking at 5 a.m. Friday, Sept. 7. (A list of affected hotels is available here.) Contracts with each hotel are negotiated separately. Note: This story was originally published Sept. 21, 2018.